We’d love your help. Let us know what’s wrong with this preview of The Perfect Murder by H.R.F. Keating. I love these "cute" little books with foreign detectives. They're so light and airy and so different than the typical American detective. When I read the obituary for H.R.F. Keating back in March, I decided I wanted to read at least one of his Inspector Ghote books. I discovered they're very hard to find outside a library. But I finally got my hands on my own copy of his first Ghote book: The Perfect Murder. Don't get excited. Mr. Perfect hasn't been murdered, but the media and Indian police see I love these "cute" little books with foreign detectives. They're so light and airy and so different than the typical American detective. When I read the obituary for H.R.F. Keating back in March, I decided I wanted to read at least one of his Inspector Ghote books. I discovered they're very hard to find outside a library. But I finally got my hands on my own copy of his first Ghote book: The Perfect Murder. Don't get excited. Mr. Perfect hasn't been murdered, but the media and Indian police seem to prefer to call it the Perfect murder rather than the Perfect attack or assault. Anyway, that's the first indication that this is going to be a well-written, enjoyable detective story. Inspector Ghote, having worked himself up to this position from his starting position as a beat cop, is rather insecure, has a boss who never seems to be in his office, and is forever having another No. 1 priority heaped on one or two other No. 1 priorities. So poor Inspector Ghote bounces between the two crimes for days. On top of this, he is the "mentor" for a Swedish representative of UNESCO who is studying police techniques around the world. Axel Svensson is forever trying to make the Indian system rational, like the system he is familiar with in Sweden. It just ain't that way. "Oh, Inspector, what questions you are asking. How should I know a thing like that? How should I know anything? I have too many things to think to be knowing why is this and why is that. It all falls on my shoulders. My son Dilip is no good. I have ordered him not to go to office today. He can think instead about what is the right thing to say and the right thing to do, and he can read his mysteries histories at home. If he went to office he would give orders, and then where would we be?" You can just hear this excessively fat man saying this. He is a wonderful character! And the entire story is that way. After a 6-book attempt to get on terms with P. D. James, Inspector Ghote came as welcome relief. A human being! A person involved with other people and not ashamed of it! A person with so many neighbours he doesn't have time to worry about "privacy" - that word that jumps up every 6 pages or so in James. A detective with a family and best of all, a detective with a heart! Whew! It was like leaving a dreary UK autumn day for a Delhi spring. Yeah, could be too hot and crowded eventually, but at lea After a 6-book attempt to get on terms with P. D. James, Inspector Ghote came as welcome relief. A human being! A person involved with other people and not ashamed of it! A person with so many neighbours he doesn't have time to worry about "privacy" - that word that jumps up every 6 pages or so in James. A detective with a family and best of all, a detective with a heart! Whew! It was like leaving a dreary UK autumn day for a Delhi spring. Yeah, could be too hot and crowded eventually, but at least you thaw out first. There is more than a slight hint of over-the-top comedy about *The Perfect Murder*, with its deliberately ambiguous title, its definitely over-the-top rhyming-slang - Hindu? he's certainly not Cockney - rich man Arun Varde, and the sub-plot Case of the Stolen Rupee (yes, just one of them.) The link between the two cases is somewhat tenuous if finally vital, and the ongoing chaos at the Varde house also tends to the edge of credibility at times. On the other hand,the power of money and the presence of corruption in Bombay come as no surprise, and the portrait of Varde's elder son with his exaggerated English argot feels as if it shd. strike maliciously home in a setting of post-British India. Then, too, the lyric scene when the monsoon and the case finally break together can seem, on reflection, just a tad too Indian, so to speak - one of those loces classici, like the sacred cows and the "brightly-clad women" that you wd. expect in any superficial treatment - but at the time, it's wonderfully cathartic, for the reader and Inspector Ghote both. Which leads to the only real difficulty about Inspector Ghote, at least for me: for the first 9 Inspector Ghote books, Keating had never actually BEEN to Bombay. Sure, he handles the inflections of Indian English as if he was born to them, not over-exaggerating the flood of present participles, doing the wordiness nicely, sure, he adds in the odd Indian word - not sure if they are in Marathi or some other dialect, though Keating does know such exist - with the panache of an Amitav Ghosh. Sure, he has a convincing presentation up and down the strata of Bombay, from the street beggars to the magnificently miserly Minister's over-plush office, with a malicious side-look at "imported air-conditioning!" and such. And he treats all those strata with a democracy sadly lacking from P. D. James's apparently unconscious sieving of an English village into Those we know and Those We Only Know About. All the same, Keating is NOT an Indian. Like Alexander McCall, who wrote a very nicely defensive preface to my edition of *The Perfect Murder*, he is from a colonizing culture taking the voice of a culture that has been colonized. And yes, we shd. all let bygones be bygones. But if Australia had been colonized by, say, the US, (not that we aren't culturally colonized already) and some US writer decided to do a novel Down Among the Oz-ites, for the edification of those Not Down Among Same, taking on the language and outlook and setting of these (implicitly inferior)Others, as if he/she belonged there, how wd. I feel? Not too damn friendly, I seem to think. Keating does a Real Good Job of Bombay. It's wickedly alive, it can be gently malicious, it's sloppy and vivid and Ghote himself is a treat. All the same, at times I had a sense of - exaggeration, for want of a better word, of stereotypic qualities, such as Indian volubility and "quaintness," especially in agitation - a sense, which might have been wholly in my own view, that the writer, like the earlier writers of Children's Lit, is silently looking over his characters' heads to the (white Western) reader, and maybe not even consciously, asking, Oh, look at these excitable Orientals! Ain't they quaint? It may be wholly unjust. In the wake of Kipling, who probably lived further into India than any outsider who ever wrote about the country, yet still could not shake off that white view at times, it wd. be hard for Keating NOT to have slid into such a stance. The theoretical question of his taking on an Indian's voice, however, did leave me putting 4 instead of 5 stars on Inspector Ghote's first appearance. Despite what McCall Smith says, I don't think even great works of fiction can wholly override the questions of who wrote them, about whom, and when. Otherwise, kudos. And whyinhell aren't all the Inspector Ghote books on Kindle instead a mere handful, and the rest only on Audiobooks? Certainly a chance missed there with this reader, publishers. As a readable detective story this is enjoyable and quite engaging. Alexander McCall Smith provides the enthusiastic introduction and one can see why because there is more than a faint echo of Ghote in Mma Ramotswe. They are both innocent but determined and resilient, both beacons of decency in a less than decent world and both rely heavily on a slightly obscure written authority for their methodology, with Mma Ramotswe's relationship with Clovis Andersen's `Principles of Private Detection' bear As a readable detective story this is enjoyable and quite engaging. Alexander McCall Smith provides the enthusiastic introduction and one can see why because there is more than a faint echo of Ghote in Mma Ramotswe. They are both innocent but determined and resilient, both beacons of decency in a less than decent world and both rely heavily on a slightly obscure written authority for their methodology, with Mma Ramotswe's relationship with Clovis Andersen's `Principles of Private Detection' bearing a striking resemblance to Ghote's with Gross's `Criminal Investigation'. The plot here is also concerned with puzzling but relatively minor crimes, which all makes for an amiable read, with Bombay and its characters colourfully drawn. It is this last which made me slightly uneasy about the book. Keating is an Englishman who, in 1964 when this book was published, had never been to India. I am sorry of this seems like Political Correctness Gone Mad, but for him then to paint poisonous portraits of some Indians, and somewhat patronising comic ones of others did worry me. Even if, as McCall Smith says by way of exoneration, such characters exist, it seems to me that it is one thing for a knowledgeable author with experience of India (even if non-Indian) to describe them, but another for a mid-1960s white Englishman to imagine them without any first-hand knowledge. This is a light-hearted crime mystery set in Bombay. The hero, Inspector Ghote, is an attractive character, warm-hearted and honourable, trying to do the right thing by his job and his family in a system filled with corruption and incompetence. Unfortunately, the rest of the characters too often seemed like caricatures, and unlikeable ones at that. Everyone is portrayed as either foolish, incompetent, lying or corrupt – and that’s just the police! And then poor Ghote has to go home to his deeply awful wife. He seems to love her – can’t think why! The plot was OK but moved along at a snail’s pace and with constant repetitions. I think the lengthy descriptive passages were spoiled for me by the fact that so much is made in the blurb and introduction of the fact that the author had never actually been in Bombay – so how authentic is the picture of the city? All-in-all, a reasonably enjoyable, undemanding read but I won’t be putting the second volume on my wish list. In spite of the fabulous preface written by Alexander McCall Smith for the Penguin Classics 2011 edition, I was so baffled by what I was reading that I was about to abandon the book at least three times. The Inspector Ghote series is a rather hard nut, difficult to adapt to. I'm afraid the newly independent India of the 1960s is not very different from today's India, and this is made me feel uneasy. Frankly, the India and the Indians described in a book are atrociously dumb, corrupt, and stupidl In spite of the fabulous preface written by Alexander McCall Smith for the Penguin Classics 2011 edition, I was so baffled by what I was reading that I was about to abandon the book at least three times. The Inspector Ghote series is a rather hard nut, difficult to adapt to. I'm afraid the newly independent India of the 1960s is not very different from today's India, and this is made me feel uneasy. Frankly, the India and the Indians described in a book are atrociously dumb, corrupt, and stupidly bound to the caste system. Everything seemed so much unnatural to me, the Westerner. ‘Almost everybody in India wants to be paid for everything,’ said at one point Ghote. I almost thought I'd also need to be paid to finish the book. And yet, slowly, the story managed to envelop me, so I needed to read it through. I'm still slightly shocked by the Indian society in which Ghote, Bombay CID, has to operate, but I am glad I finished the book. But no, I'll never go to India, not even in today's conditions. I'm not Axel Svensson, and I'm not with the UNESCO. H.R.F Keating is a writer I had read about in the newspapers (in The Telegraph, Kolkata) as a college student.At that point of time I was hardly interested in crime fiction or had read up a very tiny amount of this genre. It was limited to Bismoi (An Assamese magazine-special edition stories), a few Sherlock Holmes short stories and a couple of novels of the popular Bhaskar-Rongmon Series (Assamese). So when a few months back I saw the Inspector Ghote series by Keating on an online store I could H.R.F Keating is a writer I had read about in the newspapers (in The Telegraph, Kolkata) as a college student.At that point of time I was hardly interested in crime fiction or had read up a very tiny amount of this genre. It was limited to Bismoi (An Assamese magazine-special edition stories), a few Sherlock Holmes short stories and a couple of novels of the popular Bhaskar-Rongmon Series (Assamese). So when a few months back I saw the Inspector Ghote series by Keating on an online store I could not resist and ended up buying the first novel The Perfect Murder (1964).I started reading the novel a month back and slowly but gradually got hooked to it.The after taste: well not the best and not the worst. The book has its moments but the plot was somehow not satisfying as far as the general thrill seeking reader is concerned. The plot revolves around the murder of, or rather the attack on Mr.Perfect, a Parsi personal secretary to big shot businessman, Mr. Arun Varde. The attack on Mr. Perfect takes place inside the personal residence of Mr.Varde himself, which makes everyone in the Varde household a suspect.Enter Inspector Ghote, from the Bombay C.I.D. and his associate Mr.Axel Svensson, ''the big Swede'' from the United Nations who is preparing a report on the workings of Bombay police.Things turn interesting as none from the Varde family cooperates with the police and try as much as he, Inspector Ghote could not progress much.On the other hand, his boss DSP Samant assigns Ghote to find a missing cash note from the desk of Minister of Police Affairs and the Arts. Curiously the investigation to the missing note is rivetingly described whereas the goings on of the Perfect Murder unfolds at a pace which does not always work. In a word this track drags, and like Ghote, we too readers are also frustrated at the lack of any clues whatsover. At the root of this immobility of the narrative is the fact that it is more of a writer's book than a reader's. At many a times deep down somewhere it seemed as if Keating was deconstructing the form of the detective novel itself, where the story had become secondary and the structure became the focus. Yes, The Perfect Murder is a perfect work of art as Keating wrote about Bombay and India without ever visiting the country around till 1970, and like all perfect things it leaves you dissatisfied or asking for more. This may explain the fact why the book won the Crime Writers' Association's Gold Dagger and an Edgar Allen Poe Special Award. It is a book which draws on the tradition of English detective fiction which is its plus point as well as its weak point; Ghote is a pleasent other just like Agatha Christie's Belgian hero Hercule Poirot was. The Perfect Murder is the first in a series of detective novels. The detective is the Indian copper Inspector Ghote of the Bombay (now Mumbai) CID. After falling in love with the cover design to find that the murder victim is the elderly private secretary Mr. Perfect cemented my affection. I knew then that this was no crush. It was love. Mr. Perfect had been employed by Lala Arun Varde a very rich man with influence at the highest levels. It is soon apparent that Mr Varde's distress at his secre The Perfect Murder is the first in a series of detective novels. The detective is the Indian copper Inspector Ghote of the Bombay (now Mumbai) CID. After falling in love with the cover design to find that the murder victim is the elderly private secretary Mr. Perfect cemented my affection. I knew then that this was no crush. It was love. Mr. Perfect had been employed by Lala Arun Varde a very rich man with influence at the highest levels. It is soon apparent that Mr Varde's distress at his secretary's death is not because of any deep feeling for a fellow man but because he sees the murder as an attack on him by business rivals. The Inspector is assured that any number of people would want to see Varde out of the way. However Varde is unwilling to name names and Ghote is hesitant to push such an important man. Then...read it yourself. It is a murder mystery after all. Since discovering Inspector Ghote I have read the first four books in the series. They are terrific throwbacks to pre-laboratory procedurals. There is no DNA, traced cell phone calls or magical scientifically found evidence. The Inspector gets his man by old fashioned police work: knocking on doors, interviewing suspects, checking alibis, deductive reasoning, common sense, the dogged pursuit of justice and clues. There are bad guys, good guys, a corruption and political posturing. On the local color side Keating packs each novel with a tour of Indian life and culture for the high brow, the low brow and all the brows in between. The author had never been to India and it shows. Cardboard caricatures for characters, no real mention of places, nor of the sounds and smells (and food) that evoke India in better authors. It's supposed to be a novel of family secrets, but the relationships are hardly even sketched in, let alone developed. You can't develop cardboard. The "case", if you can call it that, wanders and wembles along to a ridiculous conclusion. I felt that the author had set up the reader and then stood there thumbing his nose and laughing at me for wading through the hundred-some pages. And this is the fellow who constituted himself judge and jury on the Golden Age of fiction in Murder Must Appetize!! Well, you know what they say about critics. I understand there's quite a long series of Ghote novels. I might possibly read another some day if I get really bored and have nothing else to read, but I wonder. He'll never replace Maigret; shoot, he'll never even get close to Nestor Burma! Inspector Ghote of the Bombay CID is sent to investigate an attack on Mr Perfect, employee in the household of the, apparently very important, Lala Arun Varde. None of the potential witnesses is in the least cooperative, they seem to have a low opinion of both Inspector Ghote and the victim as people of no importance. In the midst of this frustrating investigation, he is sent by his superiors on a priority case, the theft of one rupee from the desk of the even more important Minister Of Police A Inspector Ghote of the Bombay CID is sent to investigate an attack on Mr Perfect, employee in the household of the, apparently very important, Lala Arun Varde. None of the potential witnesses is in the least cooperative, they seem to have a low opinion of both Inspector Ghote and the victim as people of no importance. In the midst of this frustrating investigation, he is sent by his superiors on a priority case, the theft of one rupee from the desk of the even more important Minister Of Police Affairs And The Arts. There is something very uncomfortable to me in this unflattering portrayal of Indian society, which becomes even more disquieting when you find out the author had never set foot in India until he'd published nine of these stories (The Perfect Murder is the first in the series). I'm not sure why a writer would set his story in a real-life environment of which he has no experience whatsoever; maybe the patronising tone would have seemed less apparent if the tale itself had been more gripping? It was no surprise to me that Alexander McCall Smith had written an introduction to this tragi-comic mystery. To me, the Perfect Murder has a strong feel of McCall Smith's work, peopled with similarly annoying and thinly-drawn characters who hold endlessly contrived and unconvincing conversations that hold up the plot to no good purpose. As is probably clear, I'm not a fan of Alexander McCall Smith's writing, if you are, you'll probably enjoy this story a great deal more than I did. I had high hopes for this novel. The premise was interesting and I like mystery and thriller novels. I also love to read about other cultures and so I was looking forward to reading this story set in India. To be honest I felt a little let down. The plot started with promise - Inspector Ghote is given a murder case to investigate and is asked to take with him a Swedish criminologist who is there to report on the Bombay police department's functionality. He's also told to investigate the number on I had high hopes for this novel. The premise was interesting and I like mystery and thriller novels. I also love to read about other cultures and so I was looking forward to reading this story set in India. To be honest I felt a little let down. The plot started with promise - Inspector Ghote is given a murder case to investigate and is asked to take with him a Swedish criminologist who is there to report on the Bombay police department's functionality. He's also told to investigate the number one priority case of the theft of a rupee (yes one single rupee) from the Minister of Police Affairs' office. Along the way he is met with eccentric characters, unco-operative witnesses and lots of dead ends. My problem was that all of the characters in this book irritated me in one way or another. I couldn't connect with any of them. There wasn't much characterisation of the protagonist and the unco-operativeness of the witnesses just made me want to scream. The plot moved along at a good pace but I think that the book could have been 100 pages shorter and the author still could have gotten in everything he needed to. As to the conclusion, I normally love a mystery/thriller where I can try to piece the evidence together to see if I can solve it myself before the revelation, but it just wasn't possible with this book. I can't say too much without revealing spoilers so I will just say that I became very frustrated in the last third of the book. The Perfect Murder by H.R.F. Keating is the first book of the series featuring Inspector Ghote of Bombay (now Mumbai C.I.D). I had always wanted to read this series, as I had been recommended about it a lot. But, after reading this book I can fairly say that I am hugely disappointed. And, I really have doubts whether I will ever read this series again. The characters in this novel were not engrossing. Neither Inspector Ghote nor the other characters in the books. They were unreal, and somehow we The Perfect Murder by H.R.F. Keating is the first book of the series featuring Inspector Ghote of Bombay (now Mumbai C.I.D). I had always wanted to read this series, as I had been recommended about it a lot. But, after reading this book I can fairly say that I am hugely disappointed. And, I really have doubts whether I will ever read this series again. The characters in this novel were not engrossing. Neither Inspector Ghote nor the other characters in the books. They were unreal, and somehow weren’t strong enough to hold my attention. The plot was flimsy. For the first 120 odd pages the plot went nowhere, there were no concrete clues, or no direction in unraveling the mystery, in fact for the first half of the book I really wondered, that what was the mystery all about. And, lastly the language. It was BAD. Maybe Keating had thought that Indians speak English in the ridiculous fashion as portrayed in the book, but today in India English is spoken as clearly and eligibly as in any English speaking country. After I completed the book, which involved a lot of page skipping, I didn't have any concrete emotions or feelings about his book. I had problems writing this review as nothing was startlingly bad or good to remember and write about. For me this was a mediocre read. This is the first in a series of mysteries featuring Inpector Ghote of the Bombay CID recently rereleased as a Penguin Modern Classic. I don't know how many titles there are in the series, but as in the introduction we are told the author didn't set foot in India until the first nine were written I'd hazard a guess there are at least ten! Now, I do love a good mystery, or what my mother calls 'a nice murder' and although I was entertained enough by this I don't think it will finding a permanent h This is the first in a series of mysteries featuring Inpector Ghote of the Bombay CID recently rereleased as a Penguin Modern Classic. I don't know how many titles there are in the series, but as in the introduction we are told the author didn't set foot in India until the first nine were written I'd hazard a guess there are at least ten! Now, I do love a good mystery, or what my mother calls 'a nice murder' and although I was entertained enough by this I don't think it will finding a permanent home on my bookshevles. It's not that there is anything particularly wrong with it, perhaps it just wasn't my cup of tea? I found most of the characters in the book to be completely frustrating and unhelpful so I felt frustrated too! Lala Varde I could have quite cheerfully strangled myself with his obstructiveness and childish rhyming language! This is the first of the Inspector Ghote series, set in India. It is a fascinating portrait of a policeman who essentially lives in two cultures, his own India and his ideal of a Western-style logical and empirical police force. One fascinating character is an Indian businessman who speaks in rhyme. Another fascinating "character" is Ghote's India. Note that some of the reviews on Amazon are about an entirely different book. Awful! I do love a cosy mystery and when I saw that this was a gold dagger winning novel I couldn't wait to read it! I wish I never bothered! I spent most of my reading time getting annoyed with all the characters, and wound up by the plot. I felt nothing for any of them except irritation. The only reason I bothered to finish the book was because I can never start a book and not finish it. Henry Reymond Fitzwalter Keating was an English writer of crime fiction most notable for his series of novels featuring Inspector Ghote of the Bombay CID. H. R. F. KEATING was well versed in the worlds of crime, fiction and nonfiction. He was the crime books reviewer for The Times for fifteen years, as well as serving as the chairman of the Crime Writers Association and the Society of Authors. He w Henry Reymond Fitzwalter Keating was an English writer of crime fiction most notable for his series of novels featuring Inspector Ghote of the Bombay CID. 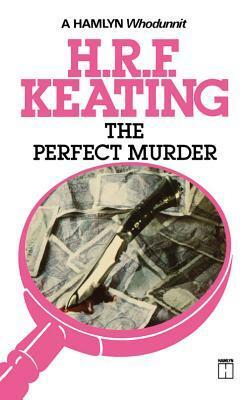 H. R. F. KEATING was well versed in the worlds of crime, fiction and nonfiction. He was the crime books reviewer for The Times for fifteen years, as well as serving as the chairman of the Crime Writers Association and the Society of Authors. He won the CWA Gold Dagger Award twice, and in 1996 was awarded the CWA Cartier Diamond Dagger for outstanding service to crime fiction.